Most of you, my friends, already know I’d rather make a special prezzy for someone than buy something. The other day I was at Costco where they had Halloween decorations down one isle and guess what was down the other isle! Yup!!! So I was thinking, there really isn’t a lot of time before Christmas and maybe we should get going on a few prezzies. Something I love to do is repurpose something old and vintage into something new and useful. I’d much rather do that than buy something new. 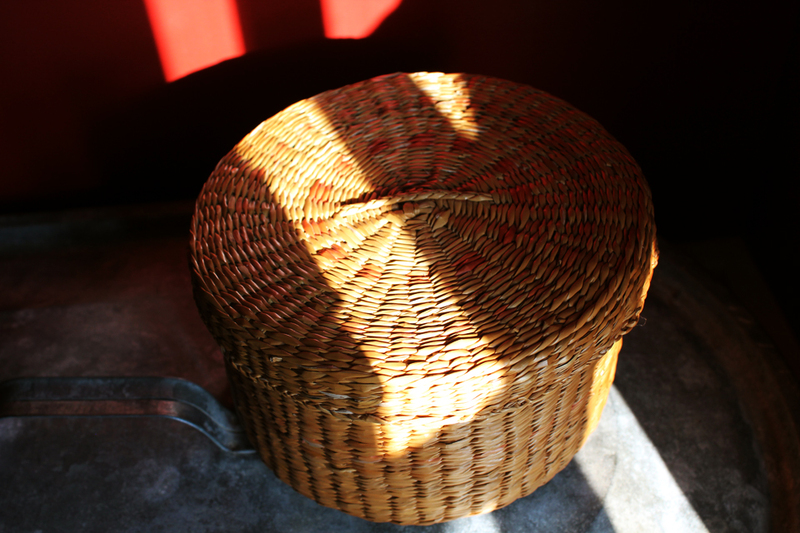 Here is one of my favourite things to make; an old fashioned sewing basket. I’ll show you how I do it. The baskets are made not only to serve as antiquity and emanate a reminiscence of village fairs and Derbies, but also are perfect for collecting offerings, typically from places of worship. 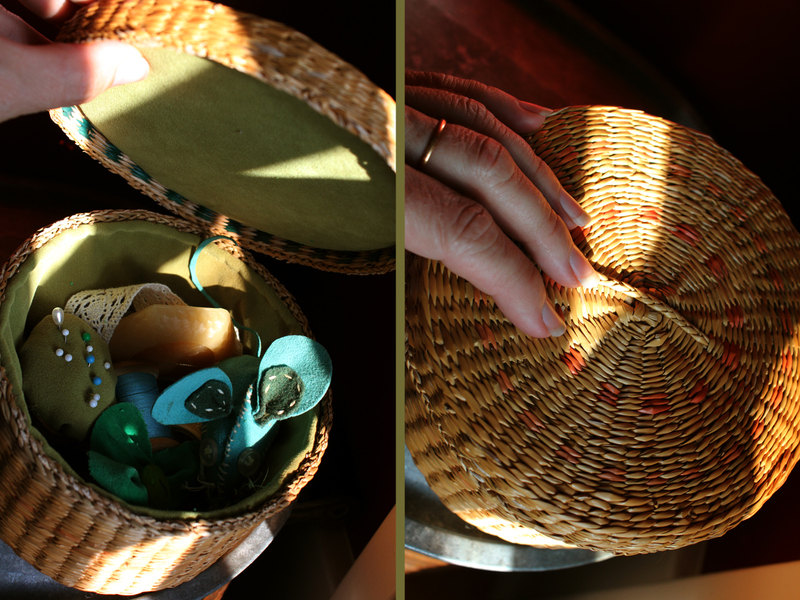 My inspiration for this project is my grandmother’s old sewing basket. It’s seen better days…lol…but I love it. Any basket will do. 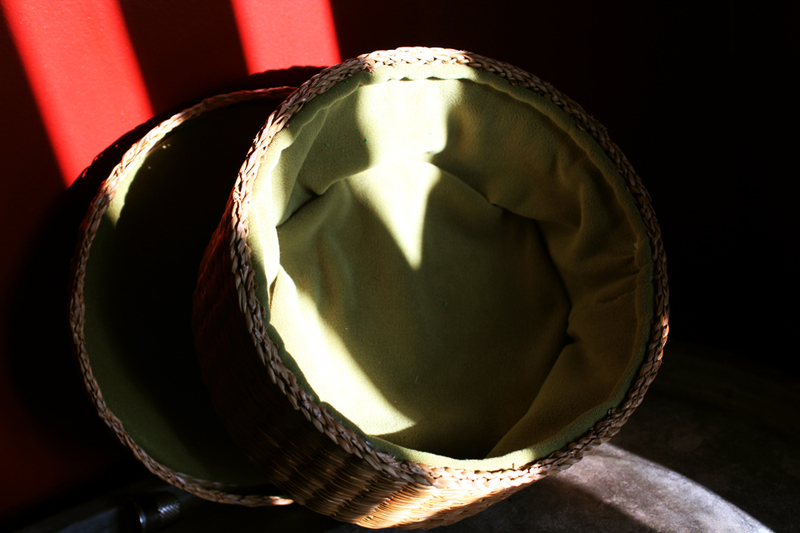 Here is a lovely, small 1940’s basket. Measure down the inside and measure the circumference. Cut some lovely fabric; here I chose a bit of chartreuse velvet. Cut a strip of the fabric longer and wider than your measurement. Turn a bit of fabric over the top and that will be the top edge. It helps to press it into place. Sew up the seam, and now you have a tube. 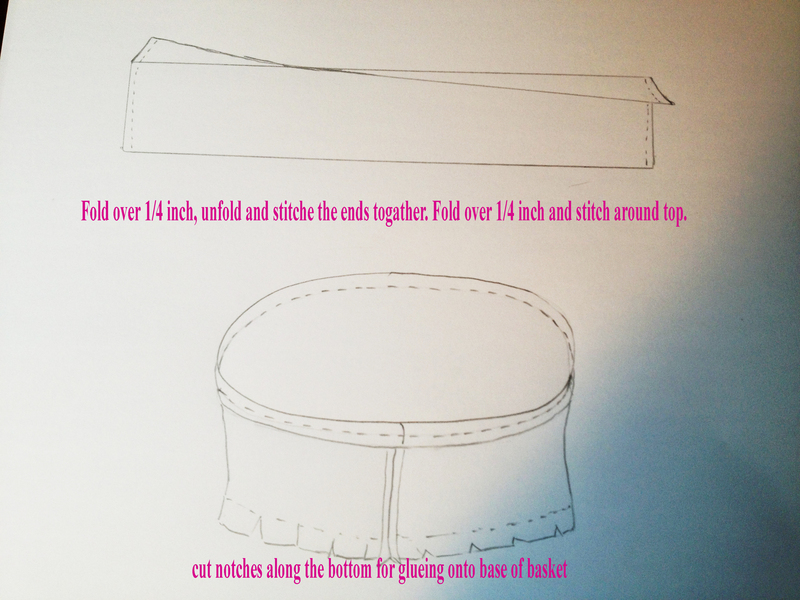 Turn the top edge over and sew a seam 1/4 inch from the top to make the seam look pretty and finished. Cut the bottom into notches to fit the tube into place inside the basket. The simplest thing to do now is to glue the tube lining into place with a hot glue gun. The simplest thing to do about the bottom is to cut out a circle of light cardboard, like a piece of cereal box, line it with a little quilting and a circle of fabric cut larger than the cardboard. Turn the edges of the fabric over the cardboard and glue into place. Do the same thing for the lid. Sometimes I like to quilt a lovely vintage button thru the centre of the top lid lining. Now prepare your goodies. 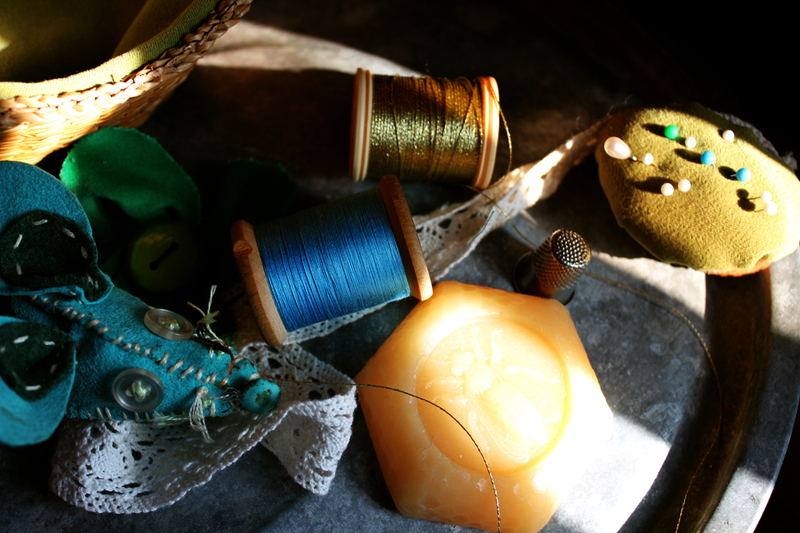 One thing I always love to have in my sewing baskets is a bit of bee’s wax. For people who quilt and embroider, bee’s wax is amazingly helpful and it smells soooo good. 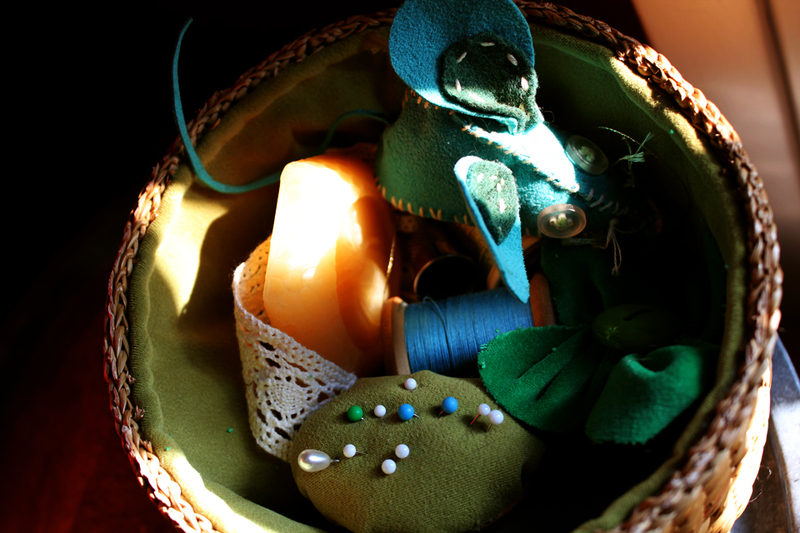 Here is a precious little mouse my daughter Chloe hand sews and a little clover my daughter Kerstie makes using vintage fabrics and buttons. Don’t worry about filling it with whimsical, lovely non-sewing things. Your loved one will cherish everything in this basket, and who doesn’t love lovely things. 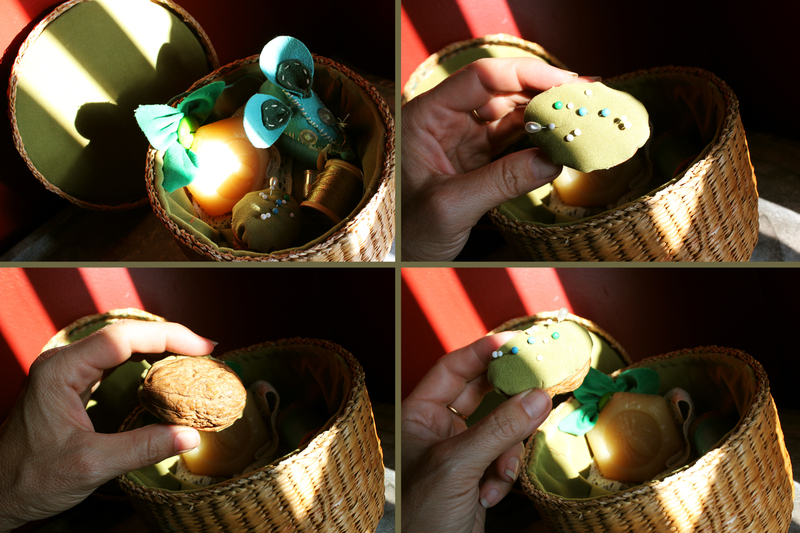 Something I always make for the basket is a special pin cushion. Here I made one from cotton batting and a circle of velvet inside a walnut shell half. (this idea came from a children’s story book from my childhood) It’s a bit tricky but once you get the hold of it, it gets easier to hot glue the velvet ball into the shell. I was hoping you would post it today! You are very talented ! You are quite talented and almost time for Tea ! how wonderful! I use to love playing in my mothers button jar. I would dump all those buttons out and categorizing in various was. I never tired of looking at them. 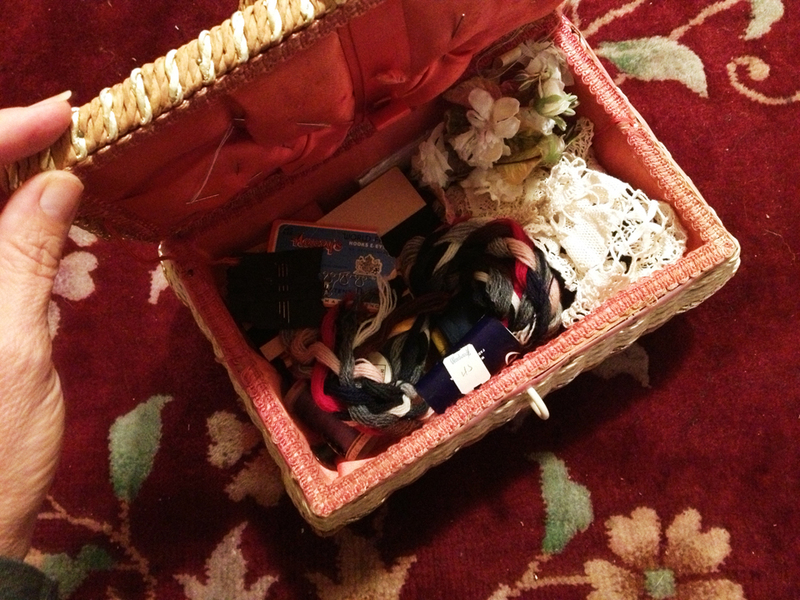 Funny how little things like a sewing basket or buttons can leave such an impact.